Mycologist, author, and visionary Paul Stamets talks about fungi’s game-changing potential for our profession…and our planet. You Can Do THAT with Fungi? In 1980, Paul founded Fungi Perfecti, LLC, a family-owned business dedicated to promoting the cultivation of high quality gourmet and medicinal mushrooms. His customers include not only gardeners, cultivators, and nutritionists, but also ecological researchers and managers. Paul’s work in mycology has been recognized by numerous national organizations. In 2008, he received the National Geographic Adventure Magazine’s Green-Novator Award as well as the Argosy Foundation’s E-chievement Awards. He was also named one of Utne Reader’s “50 Visionaries Who Are Changing Your World” that same year. In February 2010, Paul received the President’s Award from the Northwest Chapter of the Society for Ecological Restoration for contributions to habitat restoration. In 2014, he received the highly acclaimed NAMA (North American Mycological Association) Award for expanding the field of mycology. Selected as an “Invention Ambassador” by the American Association for the Advancement of Science, Paul was also the first-ever recipient of the Mycological Society of America’s Gordon and Tina Wasson Award. Paul has written six books and numerous articles and papers on fungi. His books Growing Gourmet and Medicinal Mushrooms and The Mushroom Cultivator (coauthor) have long been hailed as the definitive texts of mushroom cultivation. In his 2005 book Mycelium Running: How Mushrooms Can Help Save The World, and his 2008 TED Talk, “6 ways mushrooms can save the world,” which has garnered nearly 3.8 million views, he presents some compelling evidence of fungi’s game-changing potential for our planet and species. Can you briefly tell us about the role of fungi in evolution? Fungi are the principle agents of terraforming. They were the first organisms to come to land more than 500 million years ago. Fungi paired with algae to form lichens. Many fungi partnered and evolved with plants, which allowed plants to march onto land. Most people are surprised to learn that fungi consume rocks. 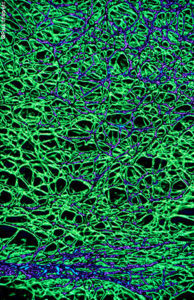 Fungi produce networks of cells called mycelium. These mycelial networks digest rocks. When they do, they liberate minerals, which are up-channeled via the roots of plants. Of course mycelium also digests plants and dead animals. They are the grand recyclers of Nature. In doing so, they regulate nutrient pathways to literally all organisms on land. And now there is evidence they also are significant part of the ecology of ocean sediments. Fungi are agents of change that run on the margins between ecosystems. They are edge runners. Their skill sets allow them to respond to ecological catastrophes, and for very good reason. A lot of the nutrients in nature are locked up, but when a stick or limb is broken, fresh surface areas are exposed, and readily colonized by competing networks of fungal mycelia. Because of the myco-diversity of fungi in the ecosystem, there is aggressive competition for that newly available niche of food. This has led to amazing groups of fungi that can capture plant and animal material as soon as it is rendered available. Through the process of decomposition, they spin off all sorts of nutrients that enable and empower successions of other organisms. A simple visual of this can be seen at our facility, where we grow tons of mushrooms a month. 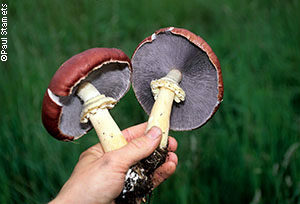 After the mushrooms are produced, the substrate becomes very appetizing to worms. Worms and other organisms – including bacteria and other fungi – then come into this complex dance, and within just three or four months, straw or sawdust is rendered into a beautiful, compost-rich soil. It is estimated that there are two to three million species of fungi on Earth. About 150,000 of these species are mushroom-forming, meaning that you can see the reproductive structure with the naked eye. Of the 150,000 mushroom forming fungi, we have only identified 14,000 species so far. This means that over 90% of the mushroom species out there in nature have not been identified. There is concern that we could be losing species faster than we can discover them. Like rivets in an airplane, how many will we lose until we jeopardize ecological sustainability? What do we know about the status of fungi worldwide? Are there known endangered fungi, and are fungi species tracked on the IUCN Red List? There are endangered fungi, and they do appear on the IUCN Red List. I have written about Bridgeoporus nobilissimus, a large polypore that grows exclusively in old growth forests (see “The Ancient Noble Polypore (Bridgeoporus nobilissimus): A Mushroom of Many Mysteries”). The common name is the Fuzzy Sandozi fungus, and I can share an interesting story about how it got that name. 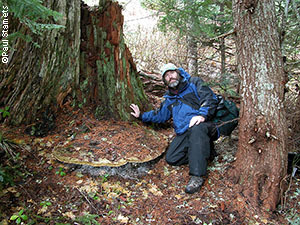 Dr. Daniel Stuntz, a mycologist from the University of Washington, was visiting George Weyerhaeuser, the president of Weyerhaeuser, a huge logging and paper products company. 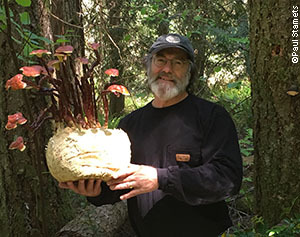 Stuntz noticed a huge polypore shelf fungus, about three to four feet in diameter, on Weyerhaeuser’s mantle, and he asked Weyerhaeuser where he had gotten it. Weyerhaeuser replied that loggers known as the Sandozi brothers had found it in an old growth forest and gave it to him as a gift. That mushroom turned out to be a new species, and it was incredibly rare. There are six or eight locations in Oregon and Washington where this fungus grows today, and those areas cannot be cut. Can you briefly describe the main categories of fungi and the role(s) that each plays in terrestrial ecosystems? All habitats are infused with fungi. These mycelial networks–the fine, thin strands that are literally underneath every footstep you take—are the construct of the food web. There are four primary groups of fungi operating in the ecosystem, and we can take a tree as an example to explain them. First, there are mycorrhizal fungi, which are associated with the roots of the tree. Mycorrhizal fungi can either be ectomycorrhizal, meaning they grow around the outside of plant roots, or endomycorrhizal, meaning they grow inside the plant roots by invading the interior root cells. 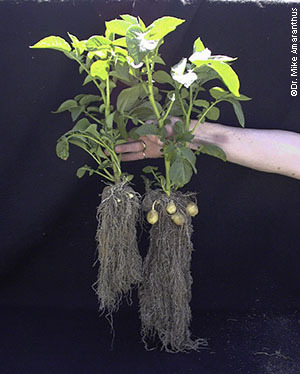 Mycorrhizal fungi have mutually beneficial relationships with the plant. The roots of the tree secrete sugars to reward the fungi, and the fungi pass essential minerals to the tree, which allow it to grow. Ectomycorrhizal fungi also expand the rhizosphere of the tree, massively extending the absorption zone and increasing the ability of the soil to retain water. Endophytic fungi are nonmycorrhizal fungi that literally grow inside of all plants, parallel to and in between the plant cells. Classically, they were called “pathogenic,” but we now know that endophytic fungi greatly enhance the immune systems of plants. There can be several hundred endophytic fungi species inside one healthy tree. This vast, complex consortia of fungal species strengthen the tree’s resistance against pathogens, parasitic fungi, and predatory insects. A tree is not fully alive; much of its mass is dead or dormant tissue. Endophytic fungi have a clever relationship with the tree: they support its immune system while exploiting its dead tissue when it becomes available. When a tree dies, saprophytic fungi come into play. Saprophytic fungi are the decomposers. They are the premier recyclers on the planet because they build soils as they decompose dead plants, insects, and other animals. There are crossovers between endophytic and saprophytic fungi. These are categories that humans have created trying to understand the language of nature. There are waves of mycelium running through ecosystems that are beyond our sight. 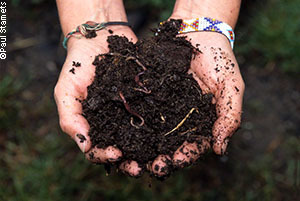 About 30% of healthy soil is composed of organisms, living and dead. The majority (70%) of those organisms by biomass are fungi. It is amazing how blind we have been to the importance of fungi when they are the main biological class of organisms that give rise to healthy soils. Why have we been so blind? Because fungi are out of view? Yes, and because of this, studies of fungi are underfunded and underappreciated. We suffer from what has been termed “mycophobia,” an irrational fear of fungi. In our day-to-day, year-to-year activities, we have common, often daily, encounters with plants and animals. Mushrooms, on the other hand, may come up and disappear within five days once a year, and sometimes not seen for many years. Some are edible, delicious, and important as food. Some are medicinal. Some can get you high and send you on a spiritual journey. Some can kill you. They are so potent, yet so temporal from our perspective. We humans have a much greater comfort level with that which is familiar than with that which is strange. Overcoming the strangeness of fungi is intellectually demanding. You must learn what species are good for you and which ones can harm you. However, we have now raised our level of consciousness to the point where we can start digging deeper into the fabric of nature, and when we do so, we find that fungi are at the very forefront. Do mycelial networks exist in ecosystems with inundated or saturated soil? If so, what role do they play in those ecosystems? Fungi are found throughout marshlands. In fact, there is an entire field of marsh mycology. Many species of fungi are saline tolerant. All grasses have endophytic fungi, and saprophytic fungi help the continuity of marshlands over long periods of time because they are extremely good at recycling nutrients. Could fungi play a role in sustainable agriculture? Absolutely. Fungi have evolved cooperatively with plants for millions of years, and this partnership has allowed plants to receive nutrients. The problem with modern agriculture is that our plants have become addicted to fertilizer, and more recently, to chemical treatments that suppress weeds. Because of phosphates and GMOs, we now have highly addicted plants whose natural nutrient cycles have been supplanted. In a sense, our plants have become drug addicts. Rather than relying on their natural immune systems and exercising their ability to get nutrients out of their ecosystems, they are being spoon fed chemicals. The result is that the soil quality is degraded and the plants are chemically dependent. 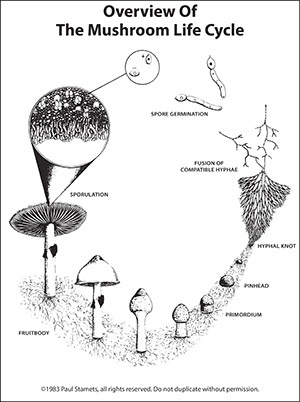 Moreover, mycelium is the immune system of these ecosystems. With their nutrient and immune systems weakened, the plants become highly susceptible to disease. Factory farming and monocultures exacerbate the problem. The consequences are reverberating throughout the world. 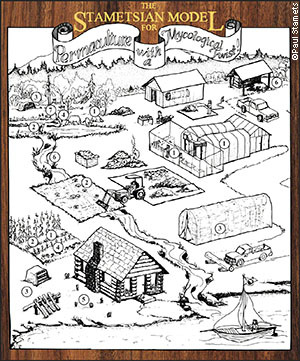 I wrote an entire chapter on “Permaculture with a Mycological Twist” in my book, Growing Gourmet and Medicinal Mushrooms. 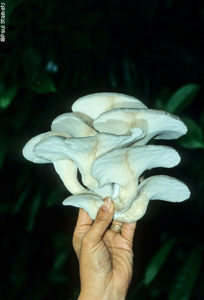 The use of beneficial fungi to attain sustainable agriculture in permaculture practices is in the forefront. All permaculture scientists and activists I know are very keen in promoting the use of fungi to bolster the immune system of crops. Many of our readers are involved in restoring ecosystems, which can mean a disturbance of soil during construction. How should practitioners take mycelial networks into consideration when they must disturb soil? Aquarium filled with soil, cardboard and straw and inoculated with Stropharia mycelium. When storms take down tree limbs, nature is subsidizing the food for mycelium. By rotting wood, fungi empower ecosystems by surging nutrients throughout the landscape. 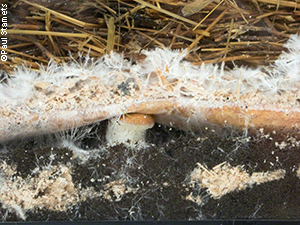 Therefore, adding more food to mycelium after disturbance will not only cause a burst in growth of the mycelium, it builds up the carbon bank in the soil. Nature needs fractal complexity at varying states of decomposition, because that creates all these niches for organisms to take up residence. That’s why I always say, “Don’t export the dead wood off your property. Let it rot!” The biodiversity in the ecosystem is the biosecurity for the food web, and you can’t get there with a monoculture. What do we know about the presence of mycelial networks in heavily paved, urbanized areas? Every city garden has mycelium, and every tree planted along a sidewalk has mycelium. Wherever there are plants, there are mycelial networks. Road engineers long ago discovered that you must get down to “mineral earth,” where there is no organic debris, before you put down asphalt or concrete. Mushrooms are notorious for causing millions of dollars of damage by breaking through concrete and asphalt. It’s crazy. You can crumble mushrooms in your hand, yet they have these Herculean forces that are so powerful they can break through concrete and asphalt! Beyond including mycorrhizae in soil specifications, what advice can you offer to practitioners involved in ecological restoration? We have lots of mycological members in our biological toolkit. Practitioners need to consider which member has the skill set most appropriate to address the issue at hand. In 1984, I purchased a small farm on the Skookum Inlet, a saltwater inlet that is a run for salmon and steelhead, and a place where clams and oysters are commercially grown. My farm had cows, chickens, and pigs. I was there for about two weeks, when a sheriff showed up to serve me a summons. Due to upland pollution from farms and failing septic systems, E. coli was threatening native fish runs and the commercial interests of the shellfish growers. My property was identified as a point source of pollution, and I was given two years to put in a certified, inspected septic system or I would be physically removed from the property. I decided to put in a 200-foot long swale of woodchips, about a foot deep, which I inoculated with the Garden Giant mushroom mycelium (Stropharia rugoso annulata). A year later, a fleet of government vehicles showed up. They said, “Paul, we’ve been monitoring all of the inflows into Skookum Inlet from the upland properties. Did you put in a septic system?” I said, “no.” Although my bio-burden had greatly increased because my amount of livestock had more than doubled by then, the goverment officials reported that the water from my property had a hundred-fold or greater reduction in E.coli contamination. 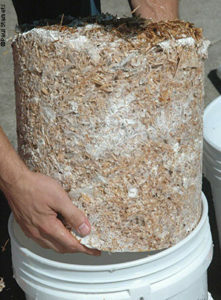 I then received a Washington State Department of Ecology grant to conduct testing on the myceliated woodchip beds. Unfortunately, during testing we had 13 inches of rain in one day! This blew out my beds, so our experiment failed because of a freaky natural phenomenon. Many years later, we received an $85,000 EPA grant to test mycofiltration using these mycelial membranes, and we showed that we could dramatically reduce E. coli flowing through stormwater or wastewater. One of the peer reviewers was concerned about tannins that might be emitted into the ecosystem from the wood chips. We went back and did parallel tests, putting water through naked wood chips versus wood chips that were covered with mycelium from the Garden Giant. Lo and behold, the wood chips that were covered in mycelium massively reduced the tannins. 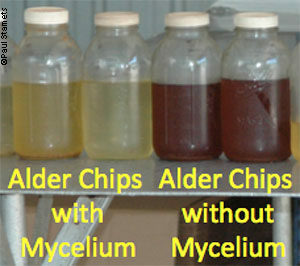 [SEE PHOTO} We found that mycelium not only removes E.coli and captures a lot of nitrogen, but it also breaks down the wood chips and confers microfiltration benefits that we are still discovering. 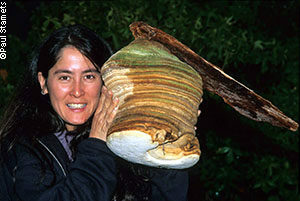 The Garden Giant mushroom is a great mushroom for everyone involved in ecological restoration. It grows anemically in a sterile lab environment, but when it hits the soil, it has a tremendous appetite for bacteria, and its mycelia –forming thick white ropey rhizomorphs-run like crazy. 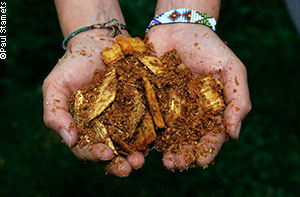 They capture the wood chips and become a biological filter. Not only does this fungus eliminate E.coli as the mycelia consume it as a food source, its mushrooms are also perfectly edible, and can weigh up to five pounds per specimen. As a decomposer, it can also quickly turn woodchips into rich soil. It is one of the species in our mycological toolkit that is at the very forefront for restoration and for cleaning up stormwater and farm waste. I think it also contributes to the importance of riparian ecosystems. I was originally trained as a marine biologist, and I once had to raise 20 coho salmon (Oncorhynchus kisutch) fingerlings sourced from a fishery hatchery in Washington State. I put them in a stainless-steel tank, but I didn’t know what to feed them. It just so happened that the Garden Giant mushroom was fruiting. When these mushrooms get big they attract fly larvae, and maggots start growing in them. I was desperate to feed the fish, so I threw the mushrooms in the tank and I waited for about 45 minutes. The mushrooms swelled with water, maggots started coming out of them, and the salmon became like piranhas. They darted after the larvae, consuming them, especially after colliding with the mushrooms to knock the larvae out. I concluded that in a riparian ecosystem, these fungi not only help capture deleterious bacteria, excessive nitrogen, and phosphorous, but they also provide food for fish. Litter from trees feeds the mycelium that grows the mushrooms; the mushrooms attract flies that create larvae; and the larvae then wash into streams and feed the fish. Now in China, tilapia and trout hatcheries feed mushrooms and mycelium to fish and have found it prevents bacterial diseases while strengthening the immunity of the fish. Is the Garden Giant the “go-to” tool in the mycological toolbox for people involved in ecological restoration? Several primary species rise to the forefront when it comes to ecological restoration. The Garden Giant is a terrestrial mushroom, and once you establish it, it wanders around your property and goes wherever debris fields are available. It can stay resident in your ecosystem for many, many years. Oyster mushrooms (Pleurotus ostreatus spp.) rapidly decompose wood and straw, but they tend to be more temporary. They stay resident for around six months, so they are a quick fix. They are extremely powerful at breaking down hydrocarbons like oil, herbicides, pesticides, and insecticides. The molecules of lignin, the fibrous substance in woody tissue, are held together with carbon-hydrogen bonds. Mycelium produce enzymes, which break those bonds in order to eat the wood, and those same bonds hold hydrocarbons together. As oyster mushrooms secrete enzymes to digest wood and hydrocarbons, they remanufacture those hydrocarbons into fungal carbohydrates, or sugars. In research that I conducted with Battelle Laboratories , we used fungi to break down Bunker C oil roughly equal in concentrations to that which was inflicted onto the beaches in Alaska by the Exxon Valdez spill. We were able to reduce hydrocarbons from 20,000 ppm to less than 200 ppm in about 16-18 weeks. This was an extraordinarily powerful example of how these fungi can break down toxins. Keep in mind that hydrocarbon-saturated environments are extremely limited in species diversity. These toxins in the ecosystem prevent so many organisms from growing. However, these mushroom-forming species are gateway species: they can break down the toxins and reduce the adversarial hurdles that limit biodiversity. Once our pile was mycoremediated, a plethora of plant species emerged, with increasing biological diversity, without any detected smell of oil. The control, untreated piles and the piles treated with bacteria and enzymes remained dead, dark and stinky. What other toxins are fungi proving to be effective at breaking down? They can break down most insecticides, including DDT. They can also break down PCBs, to varying degrees. 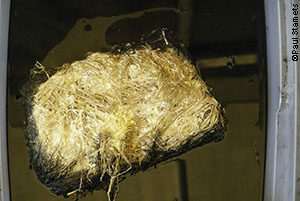 In addition, fungi also can be trained to break a substance down. During some of my work with the Department of Defense and Battelle, we discovered that we could train two species of mushroom-forming fungi to break down the neurotoxin VX. We challenged 28 species by giving them VX as the sole nutrient source, and out of these 28 species, two of them were trained to break down this neurotoxin. It took us about four months of stepwise increasing the amount of VX and decreasing the amount of natural nutrients. The end of this experiment showed that the two species adapted their enzymatic digestive juices to use VX as their sole nutrient source. 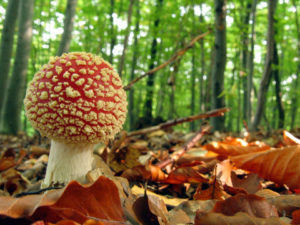 Fungi are highly adaptable to toxins in the environment, and they can elaborate unique enzyme suites targeted specifically to the challenges that they encounter in the ecosystem. Your work has shown that extract of the mycelium from the agarikon mushroom (Fomitopsis officianlis) , a hard woodconk polypore, can help protect human blood cells from the family of viruses that includes smallpox. The agarikon’s habitat, old growth forest, is in rapid decline. Has knowledge about the role of fungi in public health brought new audiences into the habitat conservation conversation? Absolutely. 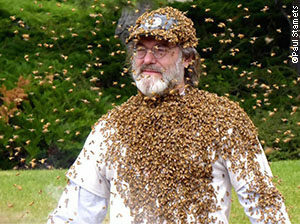 By far, my greatest recent discovery is that I think I have found a way to save bees from colony collapse disorder. 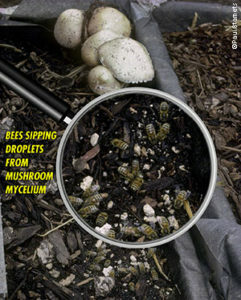 Just yesterday, we got more research results on polypore mushroom reducing viruses in bees. 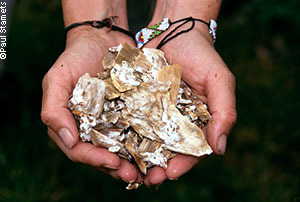 Through our research and tests with the USDA and Washington State University, we have found that extracts of the mycelium of agarikon, reishi (Ganoderma lucidum), chaga (Inonotus obliquus), amadou (Fomes fomentarius)—all polypore mushrooms that grow in the woods—dramatically reduce the viruses considered to be the primary cause of colony collapse disorder. Other causes include loss of habitat, malnutrition, neonicitinoids, glyphosates and insecticides, but five primary articles in 2016 scientific literature identified viruses vectored by the Varroa mite as being the primary cause of colony collapse disorder. All bees analyzed by UDSA laboratories specializing in bee viruses now have these viruses. This includes native bees. I have quite a few patents on this now. My research has all been authenticated by top-notch laboratories such as NIH Virology, U.S. Department of Defense, USDA, and multiple universities. A friend who I met through TED, Lee Stein, observed from afar and then closely, and he was my greatest supporter in moving this research forward, helping finance some of these studies through non-profit foundations. The fact that these polypore mushrooms reduce viruses that harm bees, people, birds, and pigs leads me to think I have found something fundamental to the foundation of nature: that the mycelium of these mushrooms is part of the immunity of our ecosystem. As we deforest the ecosystem, we’re dismantling the very food sources that give rise to these mycelial networks and maintain the immunity of the ecosystem’s inhabitants. We are dismantling the very fabric of nature — the immunological networks that mycelium provide. There is a crossover of interspecies benefit from the antiviral properties of these mushrooms. How much attention is coming to this now with your recent work? I was approached by the MacArthur Foundation to put in an application for their 100&Change Grant. This is a $100 million grant to fund a single proposal from a single person for a paradigm-shifting, scalable solution that can be globally implemented. Maybe I don’t have a snowball’s chance in hell, but I don’t know of anything more important that is at critical mass now than losing the biosecurity of our food networks because of colony collapse disorder. And colony collapse is accelerating – we may lose commercial pollination within 10 years unless we can find a solution or at least slow down these trends. How and when will these fungal solutions to colony collapse disorder be applied? We are in hives right now. We are working with Washington State University and other universities, and are scaling up as rapidly as we can. We have reproduced these results four times in three different laboratories and now have had success outdoors in the field. The solutions are easily deployable. All commercial beekeepers feed their bees sugar water, and we introduce an extract of the mycelium into the bees’ sugar water. You just add ~ 1% of these extracts to the sugar water and there are dramatic effects. The extract not only reduces viruses, but extends the bees’ longevity. On October 25th I received a U.S. patent on this idea, and I have filed international patents as well, including an Australian patent, which was just issued. Provided I can afford to do so, my hope and intent is to open source this patent for global benefit. Your readers can stay up to date by visiting my web site, fungi.com. What led you to probe the possible connection between fungi and colony collapse disorder? I was growing the Garden Giant mushroom in my garden, and one day in 1984, I noticed a continuous convoy of bees going from my bee hives to my garden giant mycelial patch. For 40 days, from dawn to dusk, I kept a notebook on it. I reported it in Harrowsmith magazine in 1988, and in one of my books in 1994, but then I basically forgot about it. I had assumed the bees were attracted by the sweet sugars being emanated by the mycelium. Then it dawned on me that the bees may need the mycelium for immune benefit or for detoxification pathways. These extracts work because there is a synchronicity of benefits on five different levels. Five different pathways synergistically come together. Mycelial exudates have within them p-coumaric acids which activate the cytochrome p450 detoxification pathways, turning on the 47 or so genes in bees that are essential for detoxification. How did you become interested in fungi in the first place? I was very shy and I always stared at the ground, so I found fossils and…. mushrooms at an early age. I first got into fungi because I have always been attracted to that which is forbidden. When I was a young boy, I would throw puffball mushrooms at my twin brother, and their spores would explode out of the puffball upon impact. One day my mother came running out into the yard saying “Don’t throw puffballs at your brother! The spores will make him blind!” This is not true, but I thought “This is good information. Thanks, Mom!” and I pelted my brother with as many puffballs as possible! I have had a severe stuttering habit ever since I was a child. Stutterers of my type do not stutter to animals or when we sing, but we stutter when we talk to people. When I was around 17 years old, I bought a bag of magic mushrooms. I didn’t’ know how much to take, so I assumed the whole bag was a single dose. I knew from reading The Natural Mind by Dr. Andrew Weil that the setting of my trip was important, so I went out to the countryside and consumed the mushrooms. I went to a giant tree on top of the highest hill in the area. The mushrooms started coming on quite quickly and I thought, “I’ll climb to the top of this tree so I can have a good view.” There was a lightning storm on the horizon. There were roiling black clouds, rolling thunder, and darts of lightning. It was very visually rich. I saw fractal patterns in the lightning — geometry I had only read about before, not seen. The storm came closer and closer, but I couldn’t get out of the tree because I had consumed too many mushrooms and was experiencing vertigo. I hugged the tree, and it became my Axis Mundi, anchoring me to the earth. Suddenly the rains came, and there were lightning strikes all around me. It was a terrifyingly interesting experience. I realized I could die up there. At that moment, I said to myself, “If I survive, I’m going to learn something from this experience.” I thought about what the biggest problem was in my life, and by far, it was my inability to communicate because of my stuttering. So I started repeating the mantra “Stop stuttering now. Stop stuttering now,” in between lightning strikes. I must have said it hundreds of times. Fortunately, I did not get struck by lightning. Studies out of Johns Hopkins University and the University of Southern California show that psilocybin, the psychedelic chemical in Psilocybe mushrooms, allows for neurogenesis, the regeneration of neurons. These studies show that under the influence of psilocybin, you can actually re-pattern the flow of information through neurons, and eliminate the fear response. I also believe these substances within mushrooms increase intelligence. They help overcome our fears. They strengthen our resolve to become braver while remaining compassionate. These are all traits that give rise to leadership. So my experience in the tree at age 17 was a N of 1 (N=1) study has now been partially medically authenticated. Mushrooms have been central and important to my life ever since. Our solutions must be ecologically rational. Fungi present a unique suite of implementable, ecologically rational solutions that could be put into the forefront. Run with mycelium! The mycelial path we share will reveal remarkable solutions. This is a path that we must share with all peoples, and for all generations. The First Peoples had it right with the concept of Seven Generations. Now we have the ecological tools for helping that vision succeed, we can overcome the many challenges we all face during these stressful times. But we must respect, learn and use nature. We are all in this together.